We were all together for a weekend back in November and, as always, we got to crafting, sewing, and visiting Jo-Ann's and Target. I gotta say, this *might* be one of my most favorite Sisterz projects. It's so perfect for this time of year--teacher gifts, small giftees for friends or party hostesses. Stuff it with a Starbucks gift card, or to a local salon or just stuff with your favorite holiday treats. Even on its own, it's adorable. So adorable, we've listed a few in the Etsy shop. 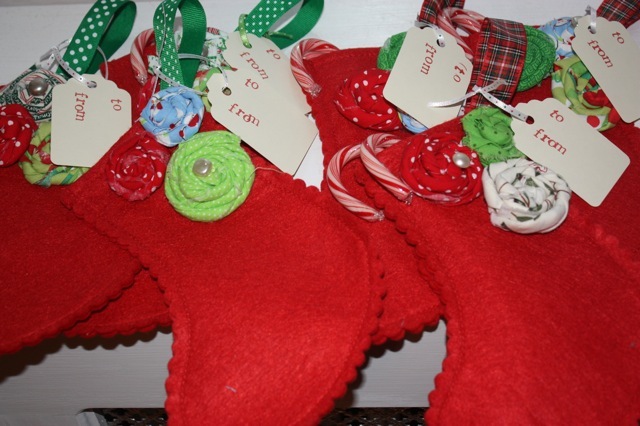 We started with little red felt stockings that were in the bins by the checkout at Jo-ann's. You know the ones. The ones where you pick up things because they are cute and inexpensive? First, we snipped off the felt loop and stitched on a piece of 5/8" grosgrain ribbon. Here's where you can get creative--anything red, white, green, polka dot, plaid, striped, etc. See, isn't plaid cute, too? To jazz it up, we also glued buttons to the center of the rosettes. 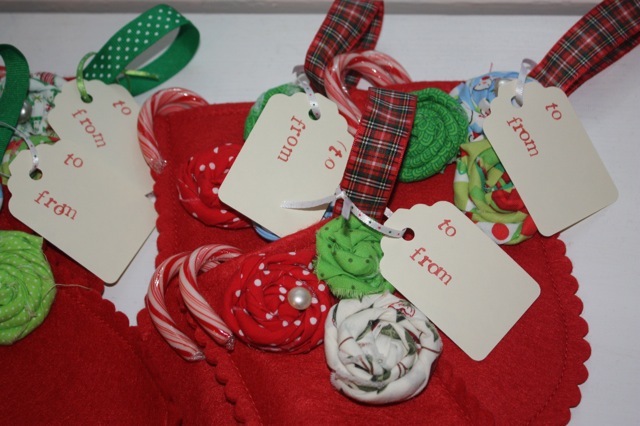 And finally, we added gift tags with "to" and "from" stamped on them. Get yourself one of those tag punches from Michael's or Amazon. Martha Stewart has a line of them. We didn't have "to" and "from" stamps but we did have individual letter stamps. These are quite handy to have because they are so versatile. So slip the gift tags on and add some candy canes and voila! you've got the perfect gift. Enjoy everyone and happy holidays!! These are so cute! You should link this project up to the Dare to DIY party over at Newly Woodwards. The theme this week is homemade gifts! Thanks so much for linking up (and to Amanda for suggesting it). I love the stockings. They'd make such a sweet advent calendar, too. Totally cute! I was just thinking the other day how to spruce up our stockings. First year that we are doing them too! Your newest followed from Newlywoodwards blog party. These are SO adorable!! Super cute idea! These are so cute! I totally love them! These are too cute! I love them! Come link up! SO cute! The addition of the fabric loops and bright rosettes really kick them up a style notch, they look wonderful. Good thinking! love love love!!!! I looked for stockings at the dollar store and in the dollar bins at Target but boo hoo did not find any!! Awww these are soooo cute and festive! Just stopping by to say thanks for commenting on the crayon ornaments over at twelve crafts. I got my molds at Target! They were a total bargain compared to Michaels of Hobby Lobby. So beautiful. I'd love for you to stop by this weekend and link up to our Christmas Stocking Linky Party. So cute! I would love for you to link up to my Christmas post! These are beautiful! Thanks for linking up! very fun!!! The rosettes are just lovely! Thanks for linking up Topsy Turvy Tuesday's!